The BRIGHTEST Christmas celebration happens at SM City Clark and SM City Pampanga, our favorite SM Malls in the country's Christmas Capital! The celebration kicks off at SM City Clark at the launch of Pyro Fest 6 last November 17. Pyro Fest began in 2012 with an earnest desire to make the Christmas season a much merrier and a much brighter occasion to celebrate. Tens of thousands of people flock yearly to witness the grandest pyromusical show in the North of Luzon. Six years later, SM City Clark reveals more of the world that we already know through Pyro Fest 6, this time, the tagline is, Unravel the World's Wonders. More than just the pyrotechniques, the repertoire each day will surely make everyone, both the young and young-at-heart, sing and dance along. The Pyro Fest 6: Unravel the World's Wonders will light up four evenings, November 17, 18, 24, and 25. Fridays and Saturdays, 7pm at SM City Clark's The Meeting Place. And capping off the celebration, at SM City Pampanga, witness as it turns the tallest Ferris Wheel in the Philippines into the Biggest Lantern of Hope through a grand pyro musical show. Get ready to be surprised by an amazing fireworks and light display on the picturesque 213-foot tall wheel accompanied with our all-time Filipino Christmas carols. Inspired by the giant parols of Pampanga which symbolize the Start of Bethlehem, the Ferris Wheel is mounted with LED lights with on-ground and aerial fireworks. By doing so, it transforms into a lantern, making it a symbol of hope for everyone during this season of love and sharing. 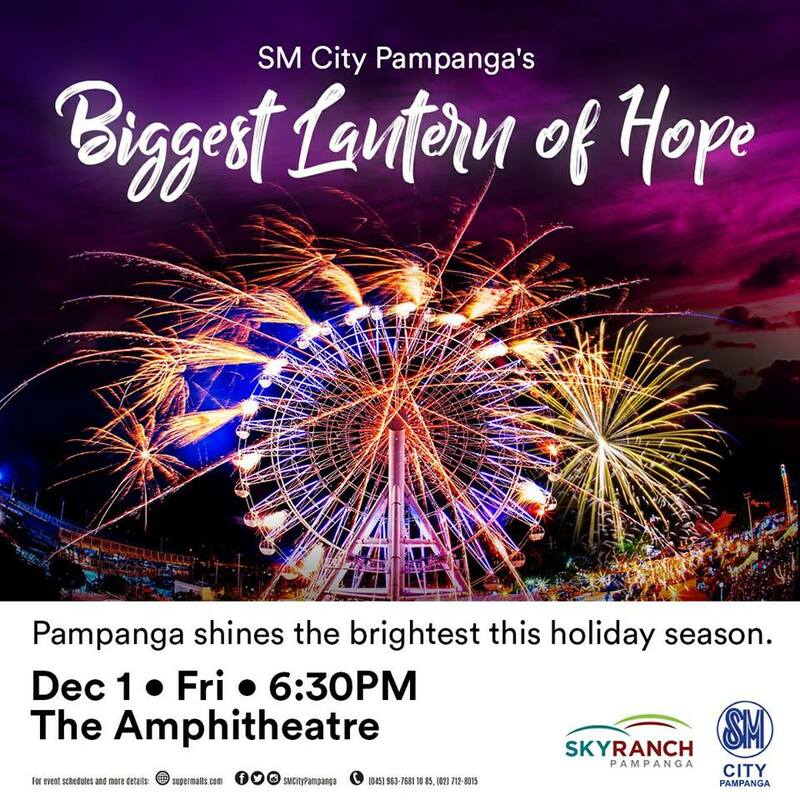 The Biggest Lantern of Hope happens on December 1, Friday, 6:30pm at SM City Pampanga's The Ampitheater. SM City Pampanga and SM City Clark, indeed, give you every reason that makes them your go-to destinations this season, where Christmas shines brightest!